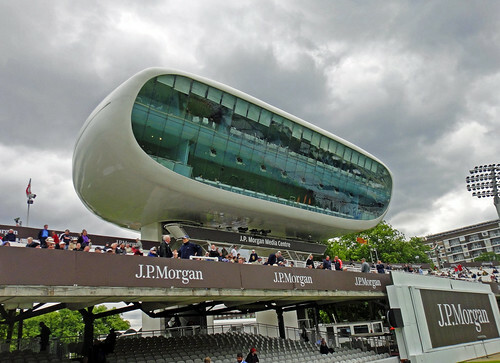 The recent England v Sri Lanka Test Match at Lords ended in a tame draw after frequent interruptions with the weather so the 5th Day crowd was sparse but at least it meant that me and my friends could get a ticket and enjoy a day chatting and drinking in the sunshine. Because there was no great rush for tickets the £20 entrance fee meant you could sit anywhere you wanted so we took the opportunity to sit in the Grandstand and the Edrich Stand. We were also allowed to go on the playing area at lunchtime, a very rare treat though I can think of no good reason ever to do so except, of course, to pass ill informed judgement on the pitch and to take some pictures. I took the chance to do both. It is because of the ability to roam freely instead of being squashed in a crowd for a day in the Mound Stand that I took and uploaded pictures of the ground I don't normally get to take. The Media centre was opened in 1999 and still looks amazing.